FIIs were net buyers of equity on Mon., Tue. and Fri. (Apr 1, 2 and 5) but were net sellers on Wed. and Thu. (Apr 3 and 4). Their total net buying was worth Rs 9.7 Billion during the week. DIIs were net buyers of equity on Thu. but net sellers on the other four days. Their total net selling was worth Rs 6.7 Billion, as per provisional figures. Nikkei India’s Services PMI slipped to 52.0 in Mar ’19 from 52.5 in Feb ’19. It was the slowest growth (a number above 50 indicates growth) since Sep ’18. The Composite PMI (Manufacturing + Services) fell to 52.7 in Mar ’19 from 53.8 in Feb ’19. After cutting repo and reverse repo rates by 25 bps (0.25%) – acknowledging a slowdown in India’s growth momentum – RBI has lowered the GDP growth forecast for FY 2019-20 to 7.2% from the earlier estimate of 7.4%. The daily bar chart pattern of Sensex rose to touch a new lifetime high of 39270 on Wed. Apr 3 but formed a ‘reversal day’ bar (higher high, lower close) that often terminates an intermediate up trend. After a pullback to the top of the large upward-sloping channel on Wed. Apr 3, the index dropped inside the trading channel on follow-up profit booking by FIIs on Thu. Apr 4. 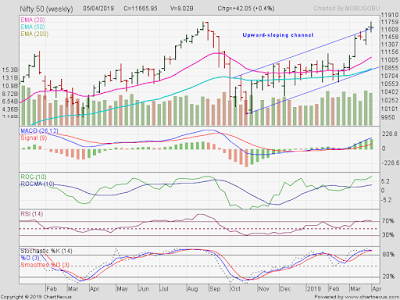 The index moved up to the upper edge of the channel on Fri. Apr 5 as FIIs turned net buyers once again, and is trading well above its three rising EMAs in a bull market. Is the index forming a large ‘double top’ reversal pattern? It is a bit too early to call. There are two technical ‘rules’ for confirming a ‘double top’: (1) lower volumes during formation of the second top; (2) an index fall below the ‘valley’ point (33292 touched on Oct 26 ’18) between the two tops. Neither of those two ‘rules’ have been followed so far. A more likely near-term possibility is some profit booking and an index fall towards the 125 points upward ‘gap’ formed on Mar 12 ’19. Daily technical indicators have corrected overbought conditions. MACD is about to cross below its rising signal line in bullish zone. ROC is facing resistance from its falling 10 day MA in bullish zone. RSI and Slow stochastic have fallen down from their respective overbought zones. The stock market has ‘memory’ – because traders remember the level of the previous top from where a sharp correction had started. Psychologically, they tend to book profits when the index is at or near a previous top. Therefore, some more correction or consolidation can be expected – specially with results season coinciding with election season. 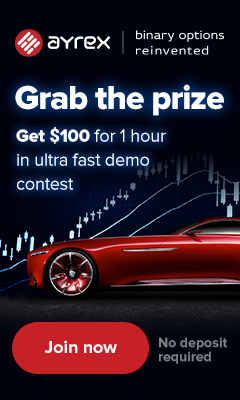 Small investors would do well not to dive into the market now. A SIP approach may work better. The weekly bar chart pattern of Nifty closed higher for the 7th week in a row, as FIIs remained net buyers. The index also managed to close above the upward-sloping trading channel for the 2nd straight week. The breakout above the channel still isn’t a convincing one, though the index did touch a new high (by 0.8 points). Follow-up buying from FIIs was weak. Nifty formed a long-legged ‘doji’ candlestick, which is a sign of indecision among bulls and bears. An observant analyst posted on twitter that the previous (Aug ’18) top was preceded by 8 weeks of a corrective move followed by 23 weeks of rally. The Apr ’19 top was also preceded by 8 weeks of sharp correction followed by 23 weeks of rally. It is one of those interesting coincidences that sometimes happen on price charts, but doesn’t have any particular technical significance. The index is trading above its weekly EMAs in a bull market. A big correction may or may not occur – but if it does, it should be used as a buying opportunity. Weekly technical indicators are looking bullish and overbought. MACD is above its signal line and rising towards its overbought zone. ROC is above its 10 week MA, and is well inside its overbought zone. RSI is moving sideways above the edge of its overbought zone. Slow stochastic well inside its overbought zone, and is also moving sideways. Nifty’s TTM P/E has moved up to 29.12, which is well above its long-term average in overbought zone. The breadth indicator NSE TRIN (not shown) is in neutral zone after rising sharply from its overbought zone. Some index consolidation or correction can be expected. Bottomline? 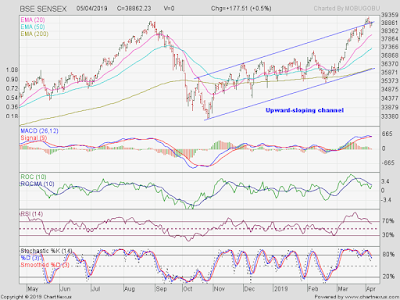 Sensex and Nifty charts are hovering near the upper edges of their respective upward-sloping trading channels, and may face some consolidation or correction before moving up further. Avail dips to add.